The first two days in Mexico City I mainly walked, not wanting to go inside anything before having a sense of the place’s outsides. There isn’t much of a walking culture here, presumably because of the ten lane Diagonals that divide the districts, but within each Colonia it’s actually very pleasant. Many trees, perhaps planted to offset the many cars. 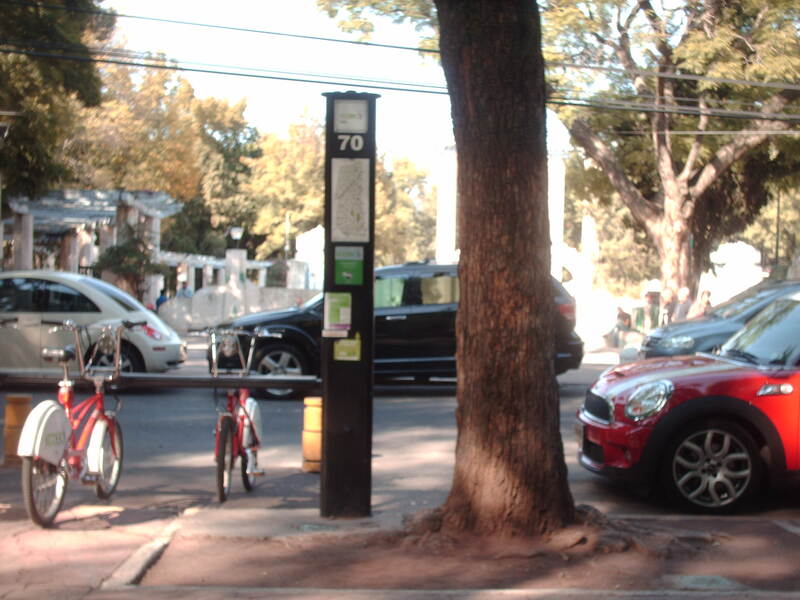 Condesa, the Barrio we’re living in, is really very European, with street cafes, a communal bicycle scheme, leafy streets and not too much traffic. When you stray out to one of the immense highways that cut through the districts things broaden out appreciably. In general there’s a mixture of the expected enormity and an integral slowness, a willingness to accept disrepair as part of life that’s not necessarily worth trying to compensate for, even in privileged areas such as Condesa. The road signs seem emblematic of this: even when hanging at 45 degrees they provide just amount enough information to allow someone to figure out which road is which, and as a consequence most of them remain like that. The same appears to be true of most outdoor things – the materiality of street furnishings that affect the walker’s mentality – paint peeling from walls, broken pavements and road surfaces, but not in a third world way, not obstructing passage or preventing anything essential from being done. As someone who doesn’t like tidying their room, this is welcome. I like this unfastidious approach to the material world. Though obviously I have no clue about the economics that underlie such questions, to the street-bound observer the irregularity seems to result not from carelessness but from careful selection of what is and isn’t important. Later, in Puebla, Cholula and Cuernavaca, colonial towns south of the Federal District we took a long weekend to see, a similar thing is noticeable, in particular in the case of churches, whose blinding gold-plated interiors are in great contrast to their exteriors, which are either flaky plaster or, for the earlier ones, solid stone. 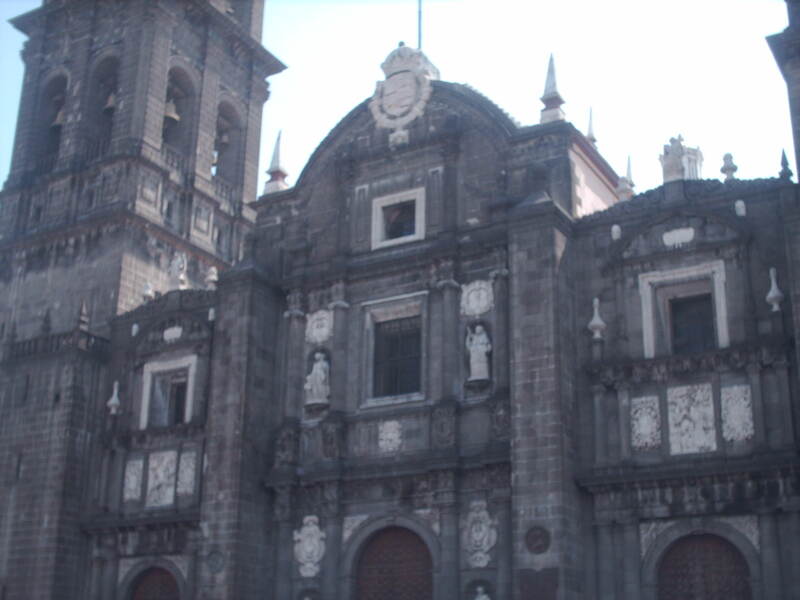 These ones were built to double as fortresses; the cathedral in Cuernavaca has spaces where there used to be canons, in case of Indian rebellion. I tried to restrain my mind, set in its ways, from formulating an inside/outside dialectic. There might be something in it though: Octavio Paz says, in The Labyrinth of Solitude, that a basic Mexican instinct is withdrawal to an interior space, and that it is connected to the security provided by indigenous feminine fertility deities, which is why the Spanish were able to institute the cult of the Virgin of Guadalupe so easily and effectively. 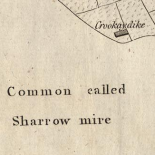 I realise I am speaking about mainly old buildings, those in the historic central areas that were built by the Spanish, and perhaps their disrepair in terms of mere tidiness is because they are now mainly valued for their structural properties. This is clearly not the whole truth, as some are very well cared for and are important for tourism, but surely the legacy of Conquest and Independence is behind part of this attitude; historical facts that continue to inspire contradictory feelings which, it seems, still inform much of life in Mexico today. Arriving in Puebla we had our first real adventure. The hostel we were supposed to be staying in turned out to be in a backwater suburb, where we were dropped by a taxi, following a hellish bus ride from the capital, in heavy traffic most of the way. It quickly became obvious that no one in the hostel felt like answering the door bell at nine in the evening – we had arrived several hours later than planned, and were met only by the aggressive barking of dogs emitting from behind the door we were apparently trying to get into. Fumbled around for a while before finding a bus into town and took the first cheap hotel available. 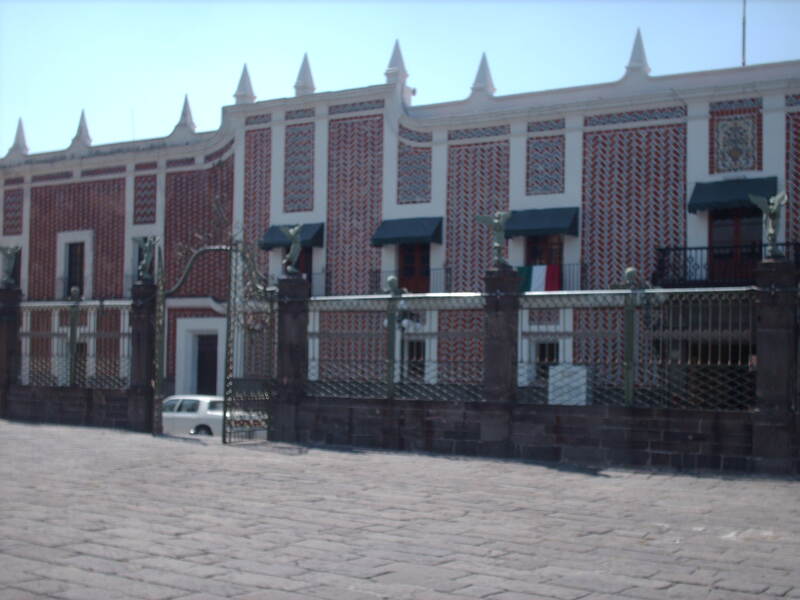 The oldest library in the Americas, the Bibliografia Palafoxiana, is in Puebla, founded by Juan de Palafox in 1646. A lovely wooden panelled room with an enthusiastic guide/librarian, who explained that the first tier was for biblical scholasticism, the second ecclesiastical history, and the third, nearly beyond view, humanities and science, giving us a neatly hierarchical impression of the relative importance of different branches of Colonial scholarship in the 17th Century. 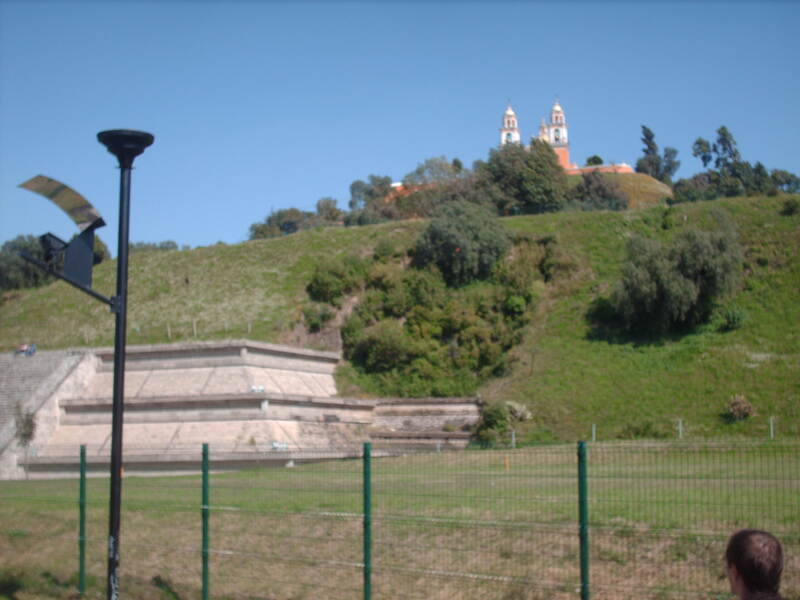 In Cholula we naturally made straight for the hill on which sits Nuestra Dama de los Remedios, another Baroque church, built, as is customary, on the remains of the Piramide de Cholula, in order to make conversion more palatable. In terms of girth this is apparently the largest pyramidal structure ever built, though obviously nothing like as tall as the Egyptian variety, and now mostly ruinous. It affords an excellent view of Cholula and Puebla, with the twin volcanoes of Popocatapetl (‘smoking mountain’ in Nahuatl) and Iztaccihuatl behind. The Aztec legend behind these two peaks, emblematic of central Mexico, is a Romeo and Juliet sort of affair, in which the two lovers hail from different tribes and aren’t allowed to marry. They abscond, but Iztaccihuatl dies of sickness, and Popocatapetl takes her to the mountains and lays her on the peak of one, and lying down beside her, waits to die. There are many variants, however. In the early evening we went out in search of sun hats and bought a bottle of Mescal instead; climbed up to Remedios again and drank it while the sun set behind the volcanoes. View of the trip so far (see banner). Made a right meal of eating the gusano worm in the bottom, and later discovered that it’s largely a marketing gimmick these days anyway and no guarantee of anything. Drunkenly walked back down the hill and indulged in the unspeakable meat of tacos for the second time in two days. 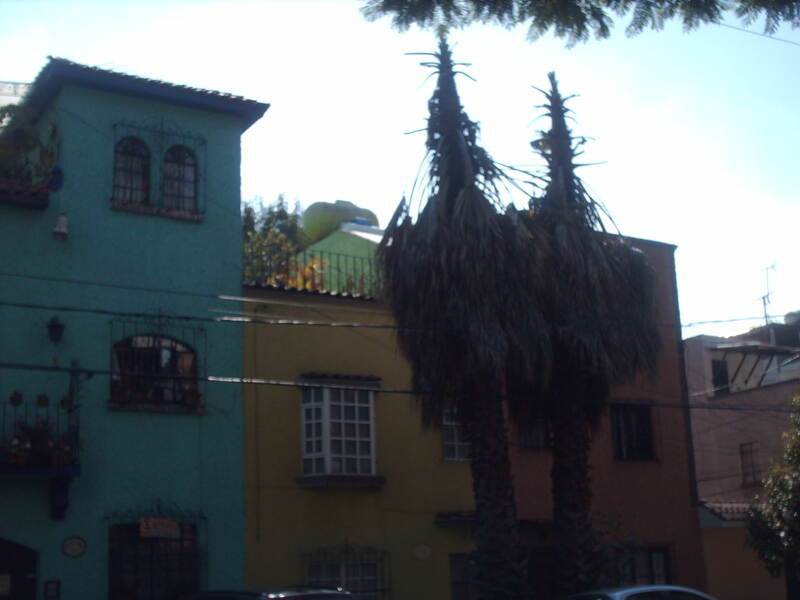 This entry was posted on October 24, 2010 by daneltro in Travel and tagged cholula, condesa, cuernavaca, labyrinth of solitude, mexico city, octavio paz, palacio de cortes, puebla.